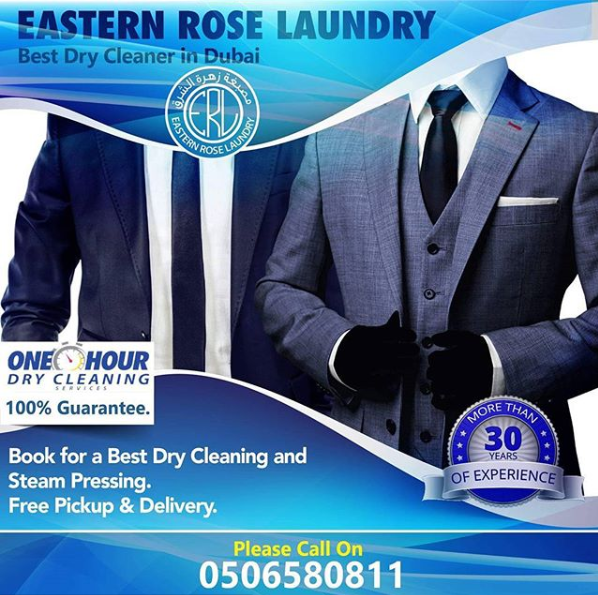 Eastern Rose Laundry - We understand that sometimes, time is of the essence and we can even dry clean your clothes within 1 hour if you come to our workshop in Al Quoz! Although we have 6 branches around Dubai to allow our many customers to be able to bring us their clothes, we a have a completely free pick up and delivery service for you to take advantage of. We are proud to be one of the most well-known and established dry cleaning companies in Dubai - a reputation we have come to enjoy because of our 100% guarantee, customer service and experience with a wide range of fabrics and garments. Although dry cleaning clothes, wedding dresses, suits and shirts is the main focus of our business, we also offer a specialist service to clean silk and leather and we'll even clean your carpets, rugs, curtains, blankets and sofas for you!